Synopsis: Carol Anne is staying with relatives in a high-rise building and the supernatural forces that have haunted her previously follow her there. 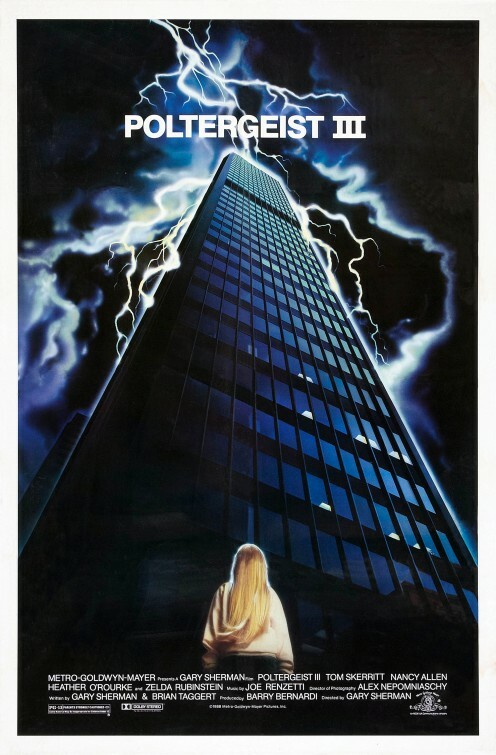 Review: The best thing that can be said about Poltergeist III is that at least it’s better than its predecessor…though the bar was set so low by Poltergeist II: The Other Side that that’s not saying much. The third sequel to one of my all-time favorite films had a troubled production and limped onto the screen amidst a cloud of doom. Still, it has one or two interesting sequences and is more than competently made…but fails to deliver on anywhere near the same level at Poltergeist. Young Carol Anne (Heather O’Rourke) has been sent to live with her aunt (Nancy Allen, Carrie) in a new high-rise apartment building in Chicago. She’s there to attend a school for the gifted but it’s clear that it’s maybe more to give her beleaguered family some distance from the girl that attracts ghosts…and most likely because JoBeth Williams and Craig T. Nelson wanted nothing to do with the movie. Her aunt lives with her new husband (Tom Skerritt, Steel Magnolias) and stepdaughter (Lara Flynn-Boyle) in a gloriously late ‘80s mirrored apartment…a perk of his job as one of the developers of the building. It’s not exactly clear how it happens but somehow the vengeful spirit of Reverend Kane wasn’t totally vanquished in the previous film and has tracked Carol Anne down with the intent to finally take her to the other side. This traveling ghost takes a page from the shark in JAWS: The Revenge and travels out of his comfort zone to lay claim to the girl that got away. Over the course of an evening, Carol Anne and her family are hunted by Kane and his minions of spirts throughout the building, from the parking garage to the swimming pool. Now I firmly believe that a good movie could have been made of the material here…but director Gary Sherman was either too limited by the paltry budget or his imagination to deliver a worthy film that wound up putting the final nail in the Poltergeist coffin. Not that he was helped by the numerous maladies that seemed to plague the film…chief being the tragic death of O’Rourke before the film was finished. Performances are all over the board here with Skerritt and Allen showing up for their paychecks (though Allen seems to have fun with how alarmingly insensitive she is to her niece) and O’Rourke improving slightly on her dreadful previous performance as Carol Anne. It’s nice to see Flynn-Boyle’s first screen appearance but stormy weather arises when Zelda Rubinstein shows up to preside over a master class of bad acting. A film that’s literally just smoke and mirrors, it’s a shame that Poltergeist III couldn’t make something of material that should have worked better than it did. With multiple deaths associated with the series that came to be known as the Poltergeist Curse, it’s no wonder the studio took one look at the finished project and anemic box office returns and decided to call it quits on future installments.